I’ve leapt into the world of fountain pens. A rite of passage I skipped was owning the widely-available Lamy Safari from Germany that every pen fiend is supposed to start with. 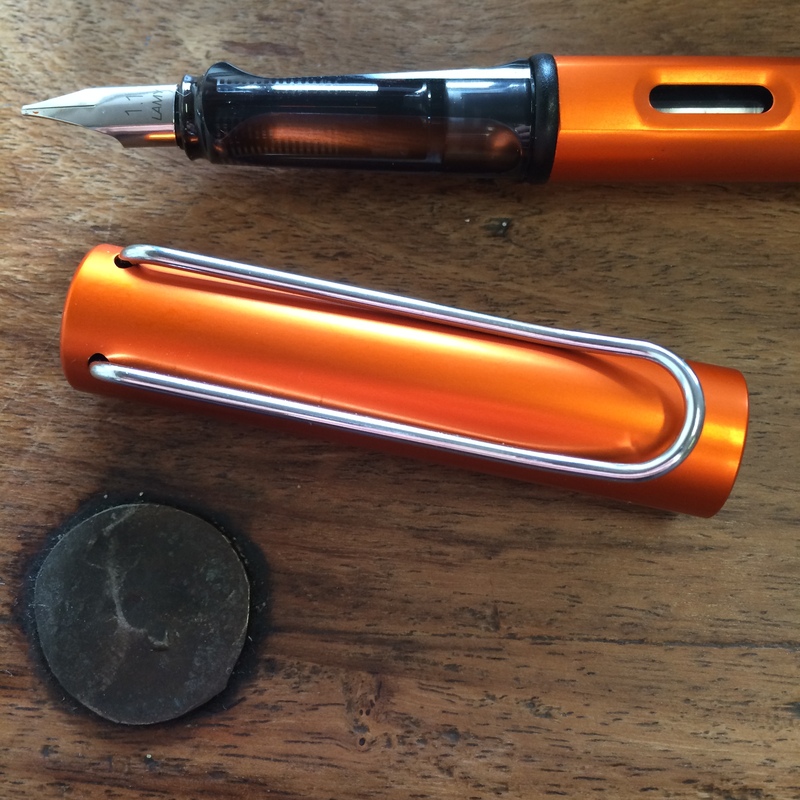 Instead, when Lamy announced this special edition orange beauty: I had to have it even though it was not an ABS plastic Safari but the more expensive (£21) aluminium Al-Star. The colour! 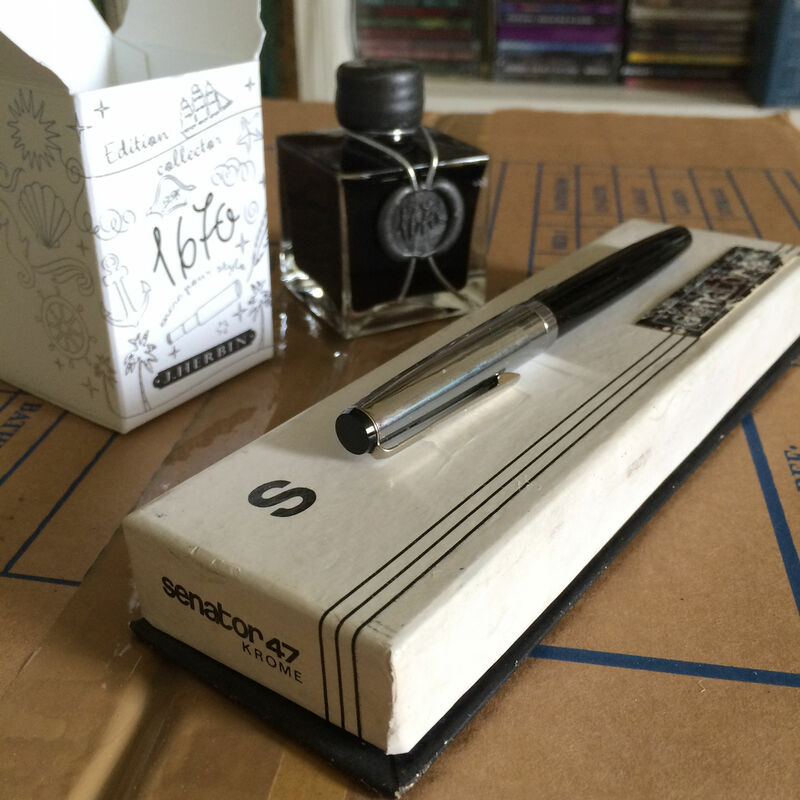 I ordered the pen straight away from Fontoplumo just after New Year and it arrived in February. In fact, I jumped the gun because the matching ink was not available then. Now you can get copperorange (one word) in cartridges and bottles. 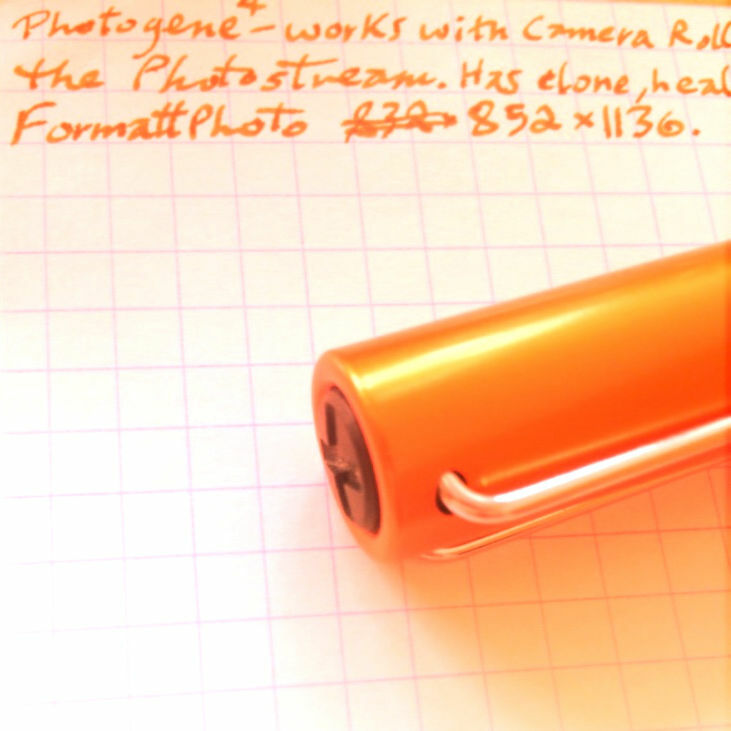 So for this review I started using Orange Indien ink which is similar but lighter than the pukka copperorange ink. And now I’ve taken so long before starting to write about this pen that I’ve carried every day, that Lamy have brought out a new special Safari colour: NeonLime. The CopperOrange Al-Star remains on sale presently. 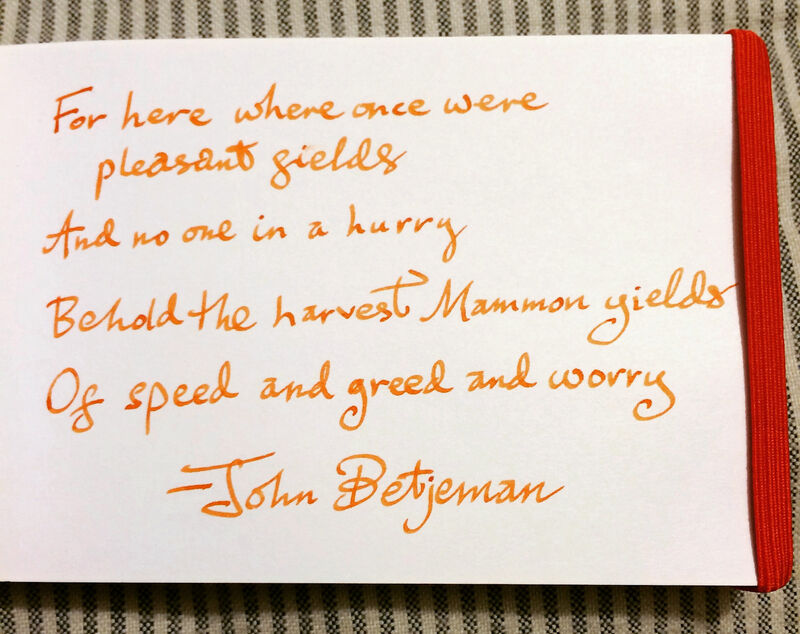 With the J Herbin Orange Indien ink, the pen would not start writing immediately if I had left it for a few minutes while I gazed into the middle distance thinking about who knows what. After a hard start the ink was also darker. 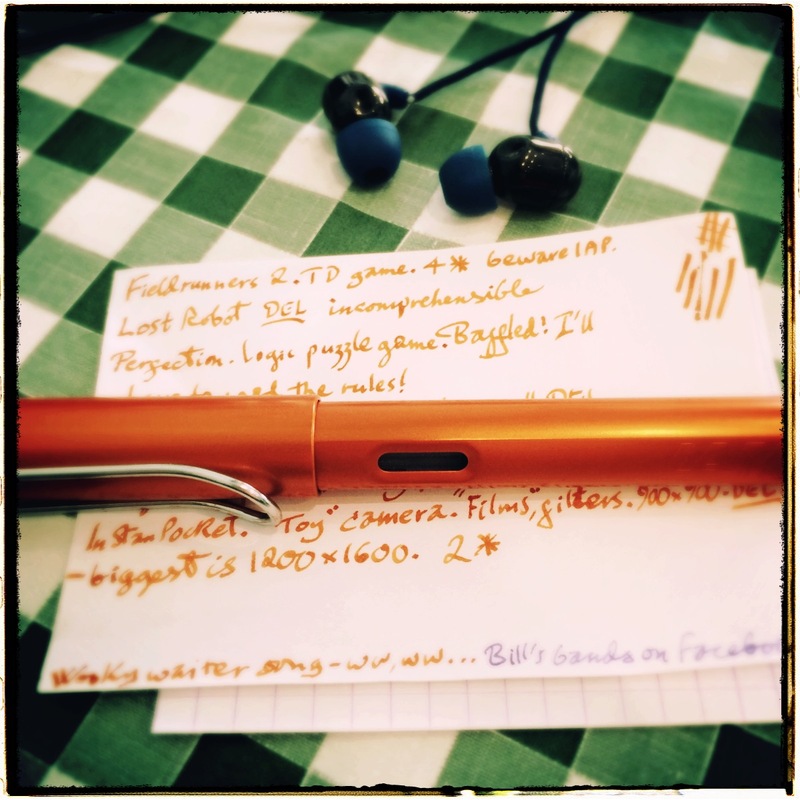 The arrival of the copperorange ink relieved this problem: no more scribbling in the corner to get the ink flow going and it also seems a bit smoother. 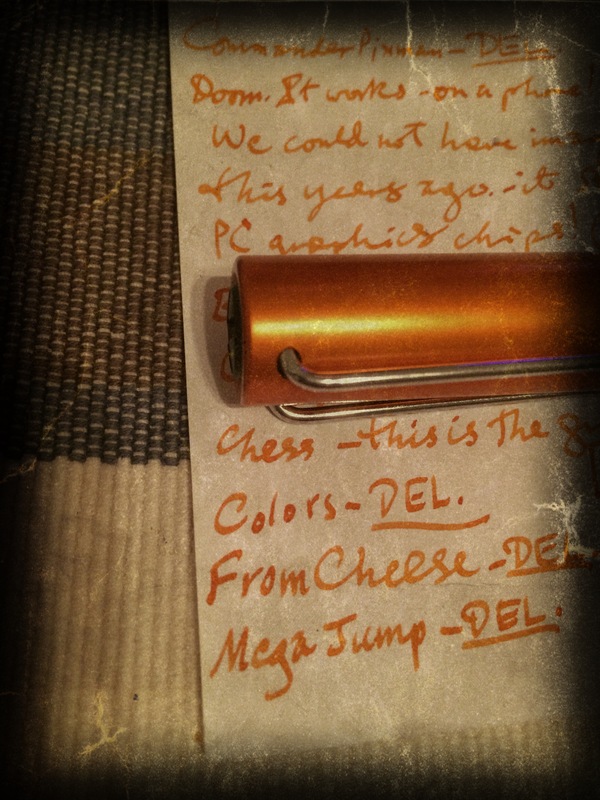 One ink note: I missed the brilliant orange of the J Herbin ink. 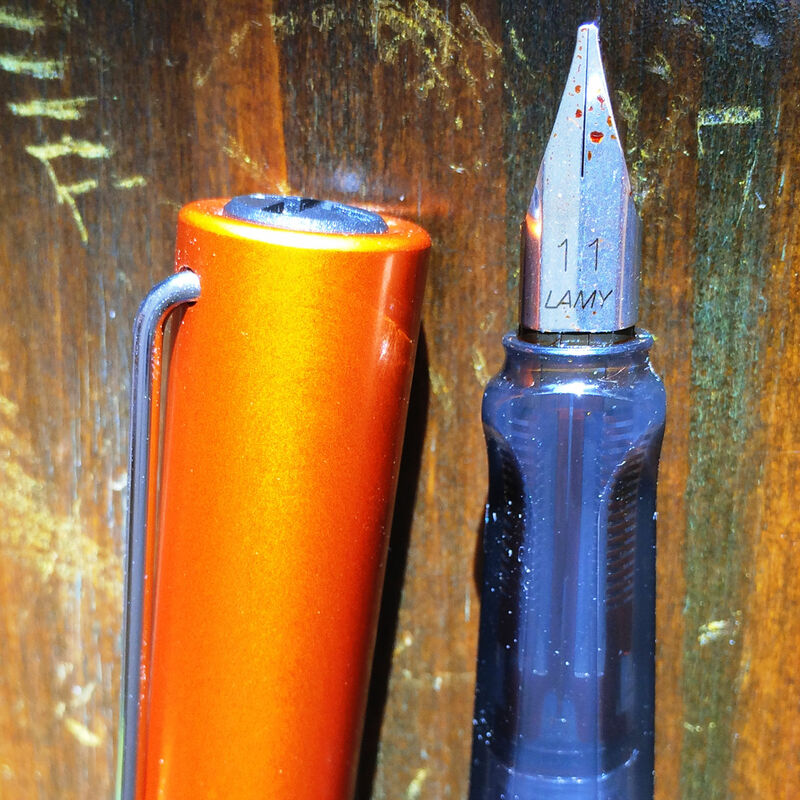 The Lamy ink is darker and shades less. 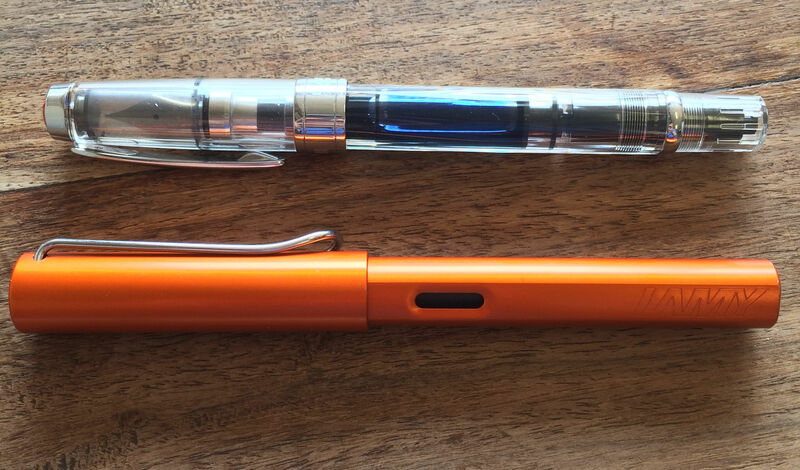 At 20 grams the pen is 2/3 the weight of a TWSBI and I have no problem using the Lamy with the cap on. The cap snaps on when closed and the unusual clip is secure in the pocket. Unlike my TWSBI it has never detached from the rest of the pen while pocketed! My grip (the way I hold a pen) suits the funky transparent triangular section. So, to sum up, this is a smooth writer. It looks great: the metallic surface gleams with rich orange shades. There is nothing wrong with this pen. It’s a bit like writing on a balloon. 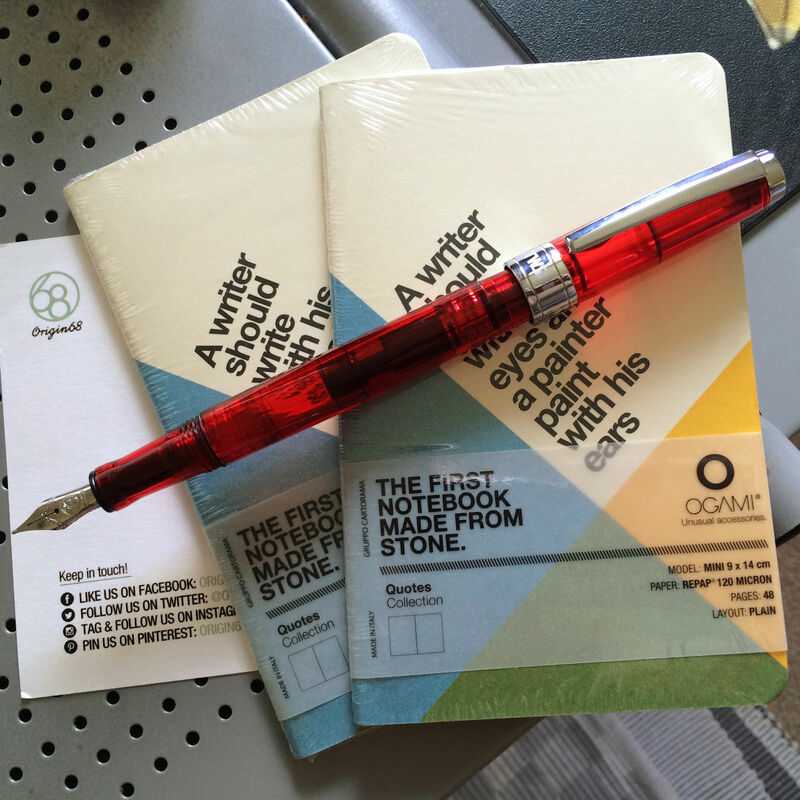 The Quotes “Writer” notebooks are made from a synthetic paper derived from limestone called RePap. The paper colour is ivory, not white, and it feels smooth like plastic. What is it good for? Absolutely — little, speaking as a fountain pen user. You can pretty much forget about using a fountain pen on this paper. Yes, you can see below that I had some success with the turquoise V-Pen, but this is an old model and the ink flow is restricted. It was not pleasant as the nib kept catching on the surface and I expected breaks in the lettering. 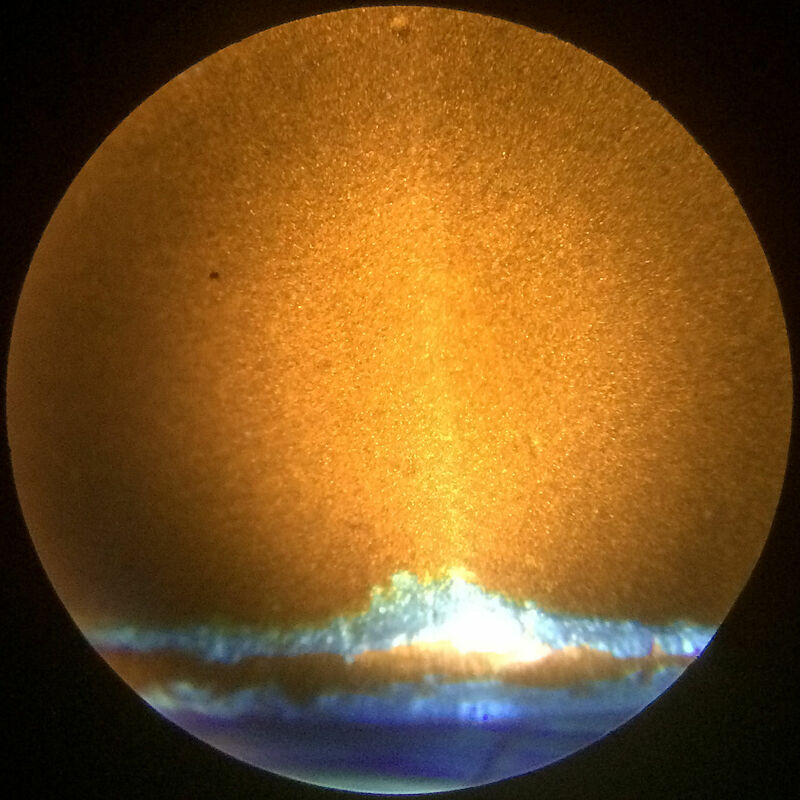 The ink did not smear, unless I let it pool or used a lot of pressure. 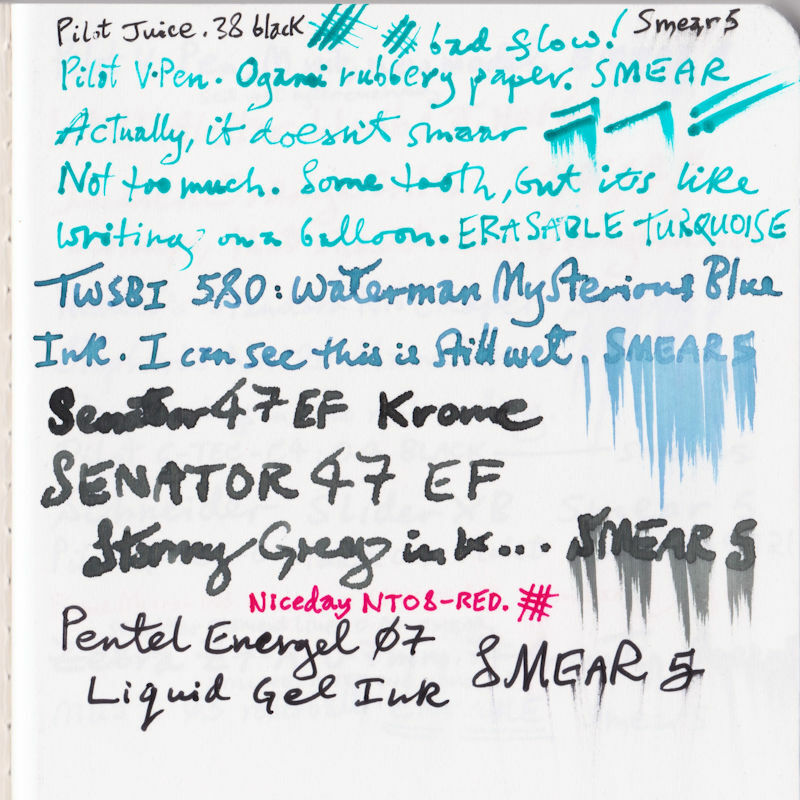 With a normal fountain pen, such as my Senator 47, which has a good wet flow: disaster! The saving grace is that the ink does not bleed through to the other side of the paper. As for flex: the tines just sink into the surface instead of spreading. Fibre tips, pigment liners, needlepoints and gel pens were more successful, although they could also catch on the rubbery surface. Biros/ballpoints (looks down nose) such as the Schneider Slider also work. 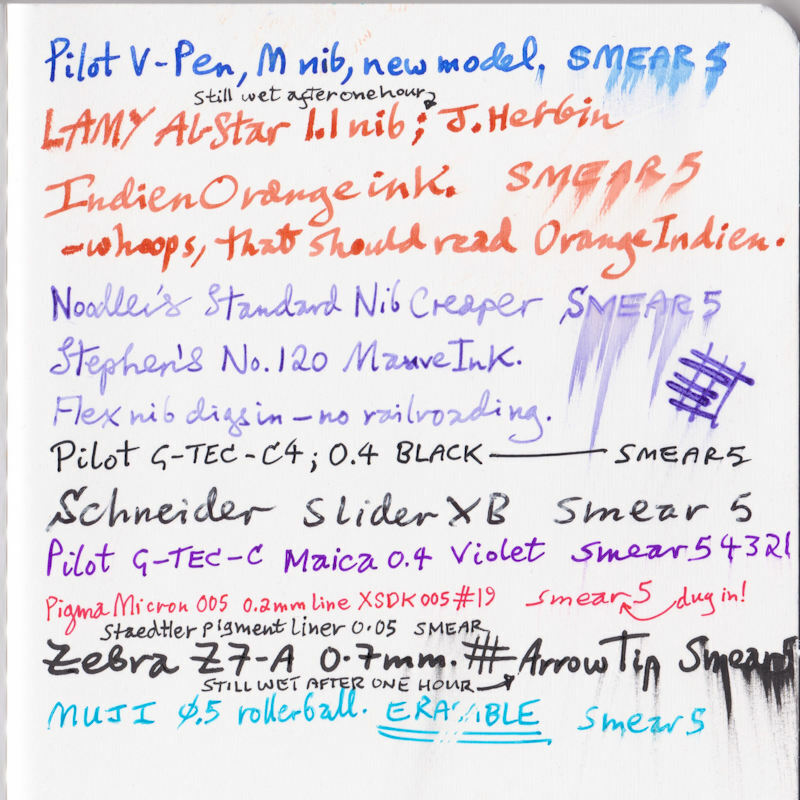 The Lamy 1.1 and the Zebra Z7 worked reasonably well, but the ink took hours to dry. 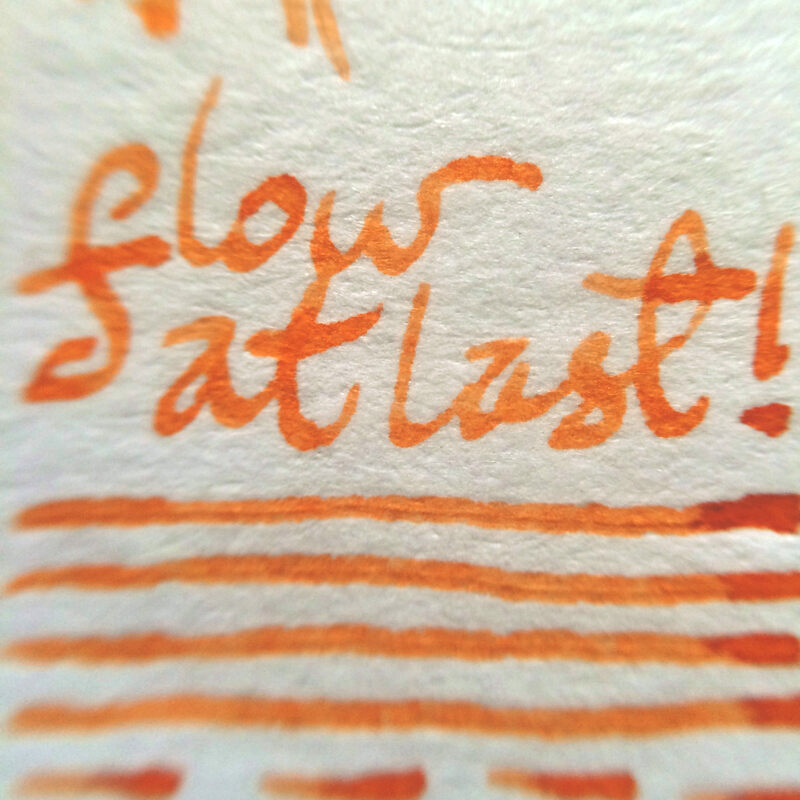 The orange J. Herbin ink eventually soaked in, bleeding and feathering. The Pilot G-TEC or Pentel Energel type of pen would be my favourite implement for this stony substrate: something with quick-drying ink and a smooth metal tip that will not catch on or otherwise break through the paper. The cover is a reasonably stiff—although thin—board and the binding is stitched beautifully. I ordered mine from Origin68.com, two for £8.00 + £2.90 p&p. 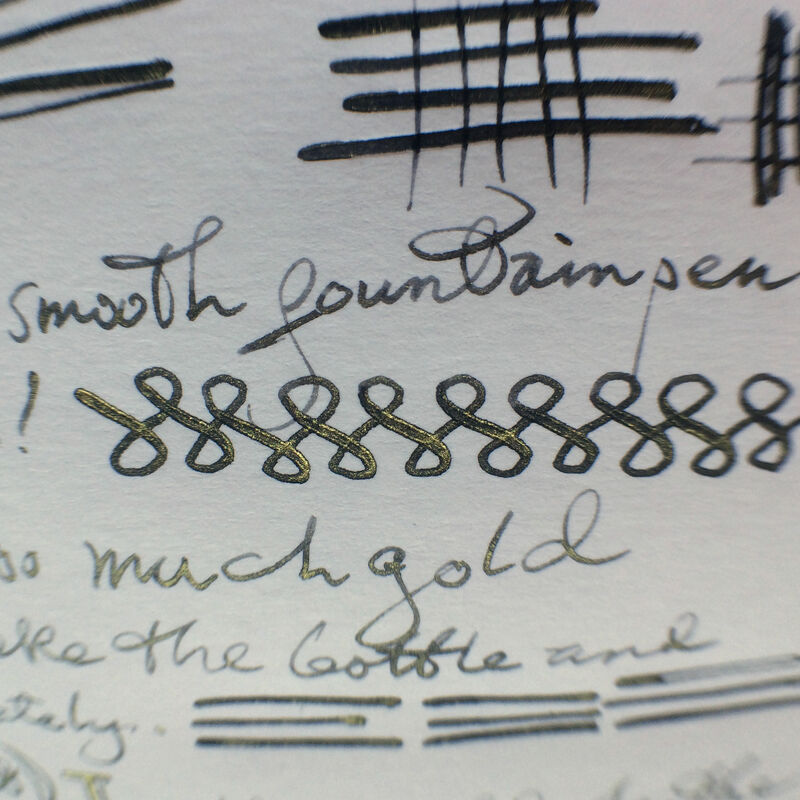 One of the first aspects of this fountain pen lark to interest me was flexible nibs. These nibs give more width on the downstroke when pressure is exerted. I soon found that not many nibs are made with flex these days, especially cheaper pens. Noodler’s Nib Creaper, and their larger Ahab, are exceptions. Other low-price options are F.P.R. Dilli or Guru pens from India, or getting lucky with a vintage pen from eBay. 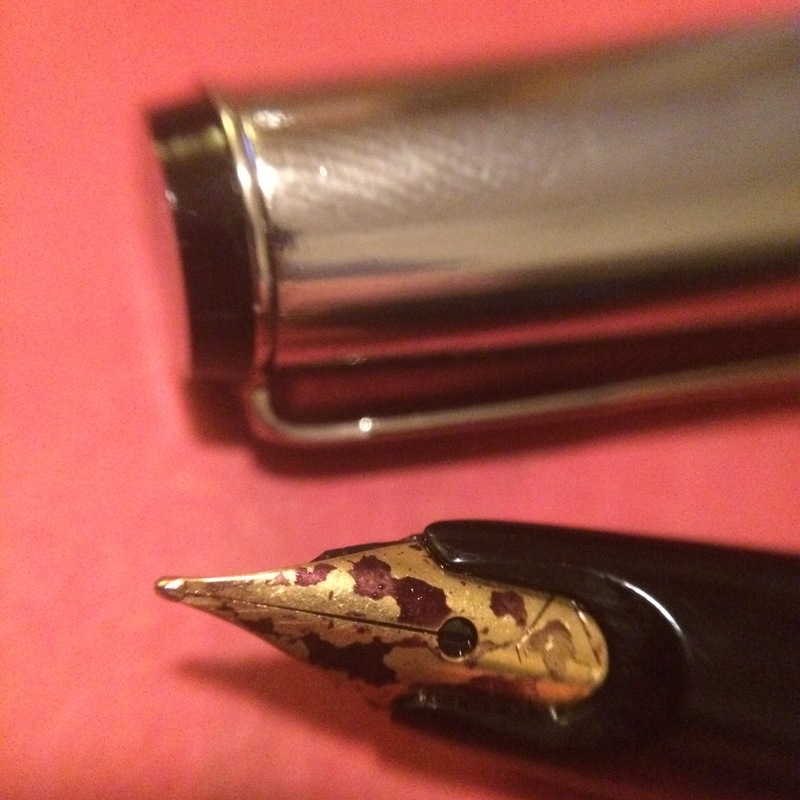 (The Jinhao X450 is advertised as flex but is firm.) I got my Creaper from Pure Pens here in the UK for £12.50. I really like this pen. After a few week’s use, the Creaper proved itself as a smooth writer that leaves a fine line or a pretty thick line when pushed into flexion. 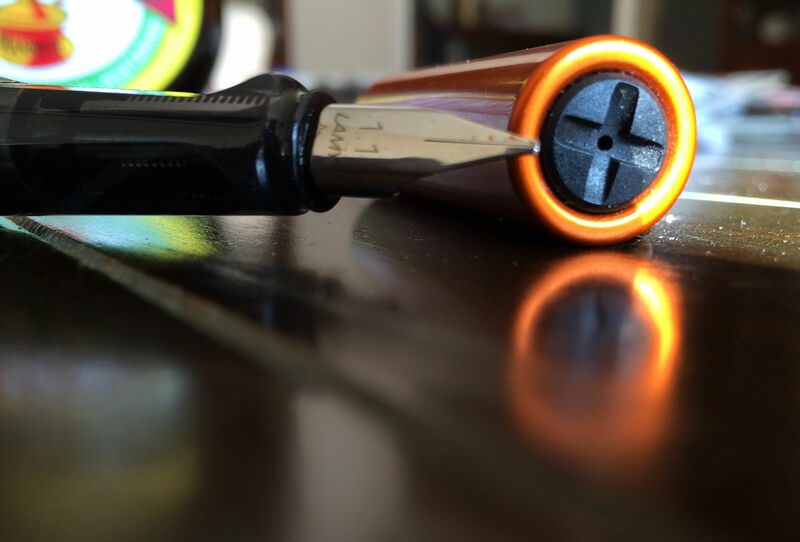 The flex and flow are adjustable by moving the feed and/or nib in/out of the pen. 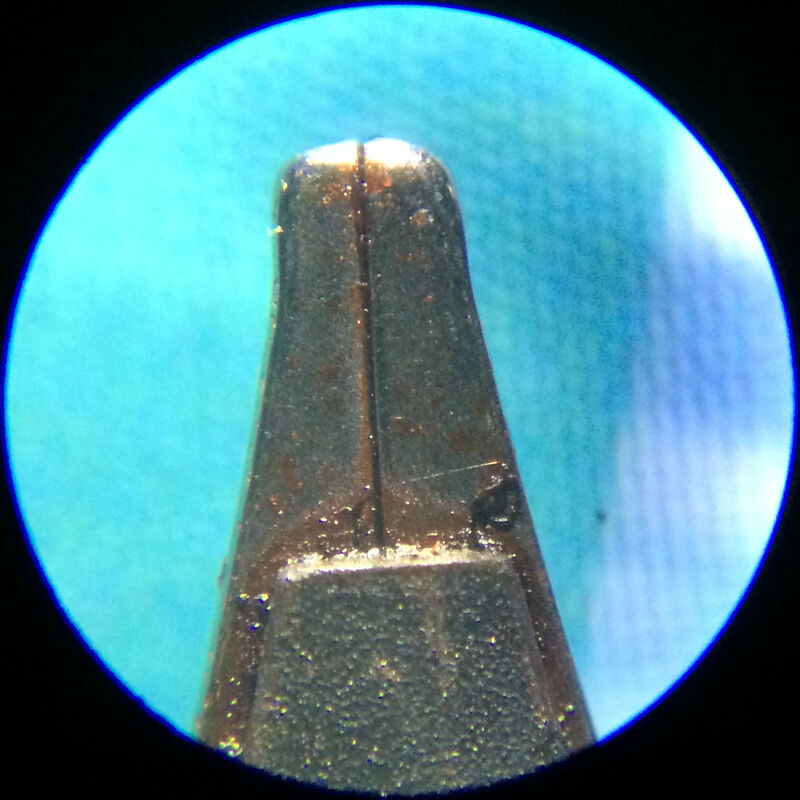 The nib and the hand-made ebonite feed are easily pulled out together for adjustment. I wish all fountain pens were like this. I didn’t get printed instructions with my pen, but the splendid Azizah at gourmetpens.com sent me a copy of the diagrams that come with the Ahab. 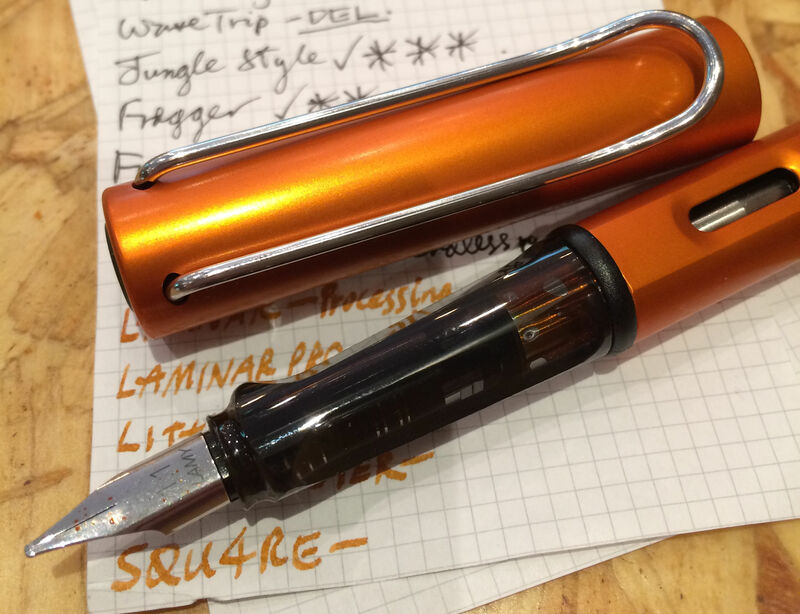 There is a useful video by Brian of Goulet Pens. Basically: feed out=drier. Nib out=more flex. Tip of feed nearer to nib tip=less flex and drier. The ink is also a variable! The pen is very light so I find it’s better capped and it’s also on the small side. The length is almost conventional, but the thinness makes the pen seem small: a compact appearance. The silver ring on the grip matches the trim on the cap. I’m impressed with the design which makes it disappointing that Noodler’s give little information on their web site. Standard Flex Pen The Nib Creaper was known as the Standard Flex Pen. The colour of Creaper I chose was the Maximilian Emerald Green Demonstrator. Demonstrator in pen terms means see-through! The translucent models are attractive to me because the ink inside can be seen clearly, hanging about, not going near the nib when you want it to. The whole width of the barrel is used for ink storage, although less than an inch of barrel exists between the feed and the piston. There are thin windows here that are transparent, like the slits on a zoetrope. The rest of the barrel is occupied by the piston control and its internal screw. The steel (?) nib is similar to the F.P.R. Dilli in that the gap between the tines extends all the way up the nib, which you might suppose gives the possibility of enormous flex. It does, but since steel is harder than gold some pressure is needed whereby the tines separate and dig into the paper. The amount of flex increases with usage, so eventually the digging decreases. The nib also railroads (see pic) which can be minimized by matching a wet ink with a greater flow. 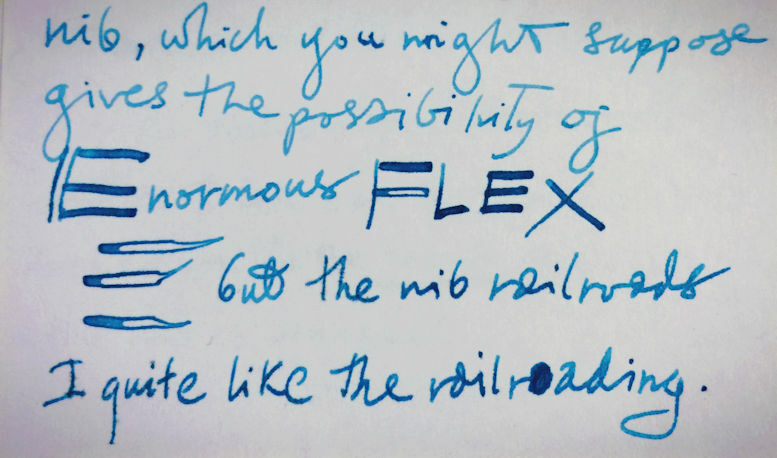 Like flex itself, used in calligraphy, railroading also has artistic possibilities so it’s not a completely bad thing. 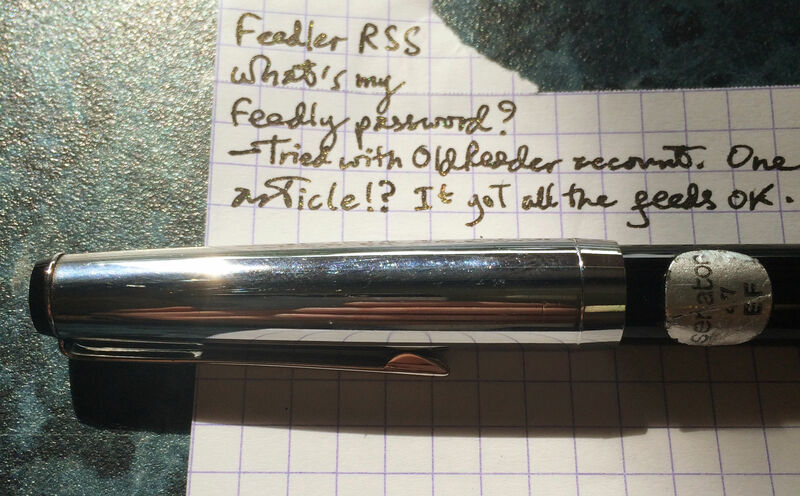 And of course, if you are not intending to write in copperplate, then the Creaper can be used as a normal pen. Any slight flex you unintentionally induce can only make your handwriting more decorative. Smell? I don’t normally sniff pens—maybe old paperbacks—but the recycled material called vegetal resin that Noodler’s use has put some people off. The smell was slight. After a few months it’s almost gone. I thought it was an OK scent, maybe like a warm photocopier if you remember them. Eno should write a song called Creaper Smell. 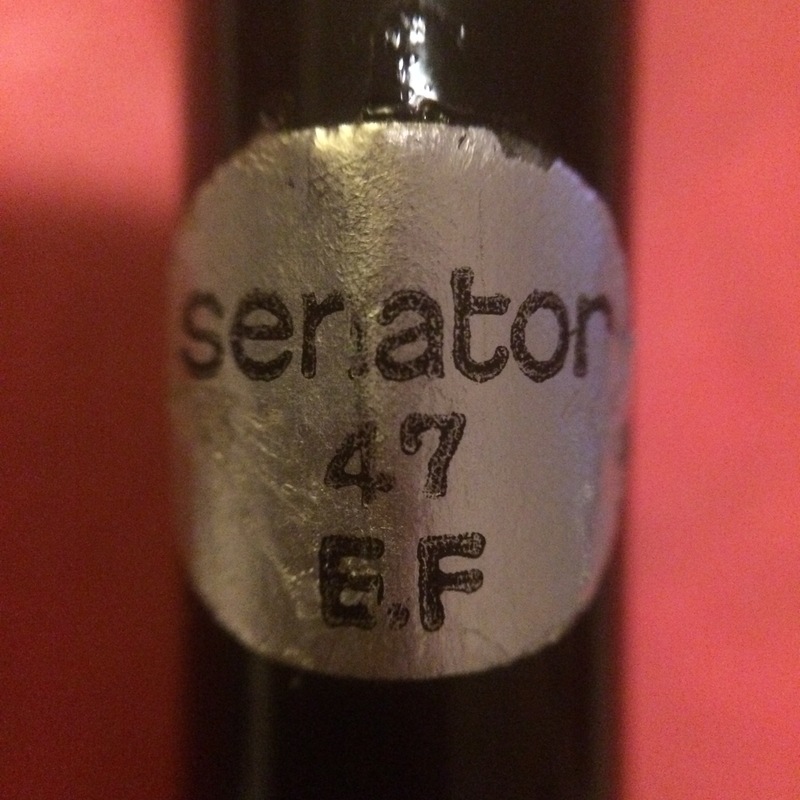 Back of the nib – no. 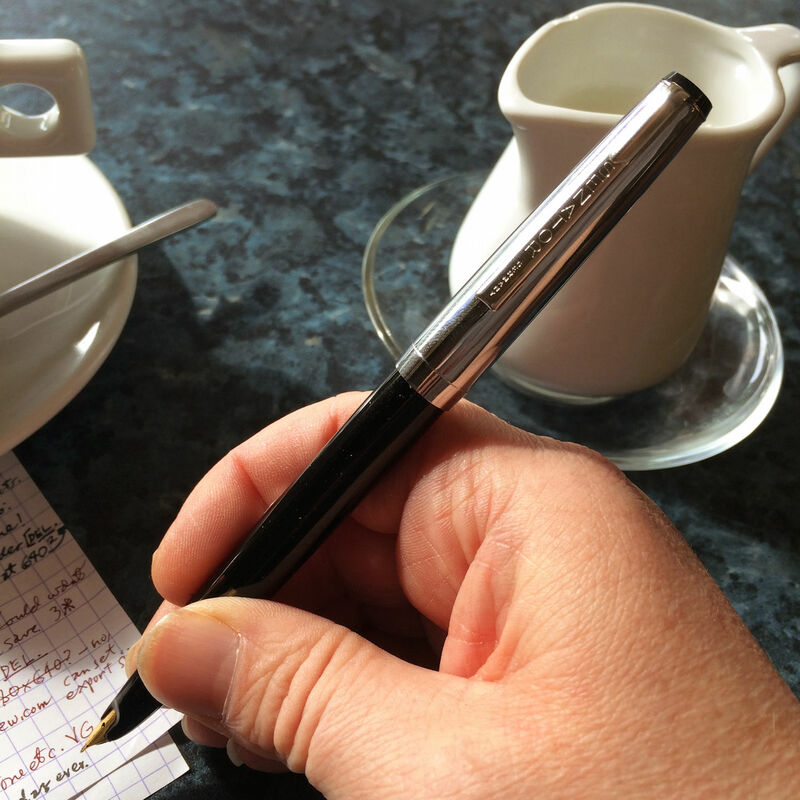 Some pens can be used upside down but despite the generous amount of tipping material on the Creaper nib it’s scratchy when used this way and the line left on paper is not much finer. This is not “as designed” of course but sometimes it’s an option. I put this pen in my pocket and I patted my pocket. It’s insanely good value for what you get: flex, compactness, smooth writing and a hand-cut feed made of hard rubber, not plastic. Another keeper. Ink used: Diamine Beau Blue on Black n’ Red paper and Noodler’s Golden Brown. If you buy vintage fountain pens on eBay, as I frequently do, you’ll notice the many brand new pens from China from marques such as Jinhao, Duke, Picasso, Baoer and so on. The Baoer 507 Xubeihong “The Eight Horses” is one such, and it’s a beast. At only £3.20 (with free postage!) 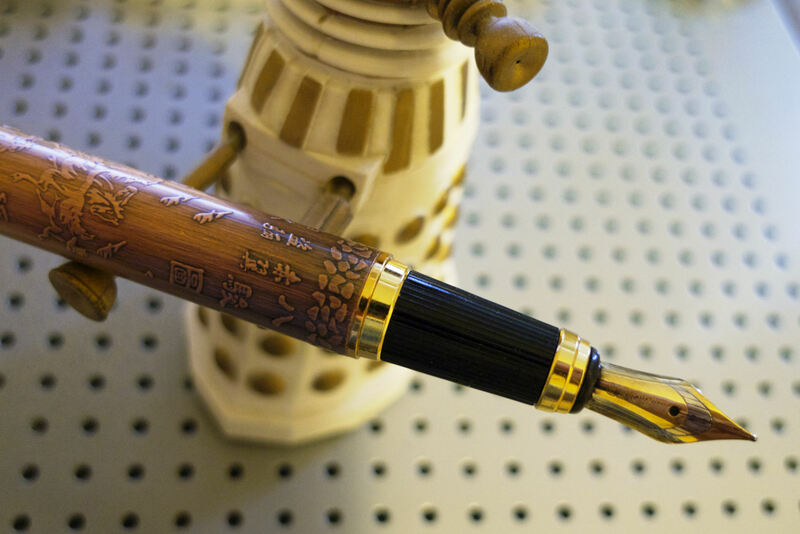 you might not expect much, but this is a big shiny black and gold pen with an embossed copper barrel decorated with Chinese characters and horses. The design and build quality is great. The 507 looks good and feels good, although it is hefty at 31 grammes. 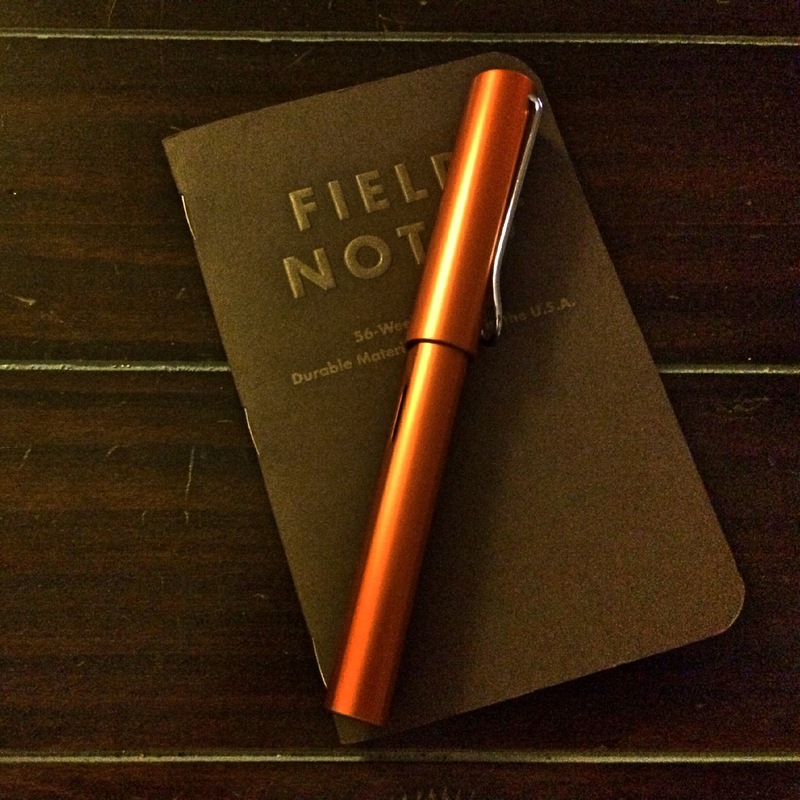 The grip is ridged vertically so that no slipping is possible and the pen feels balanced when “posted” ie, with the cap on while writing, although it is much lighter without the cap. The snap-cap fits with a satisfying click or posts firmly. 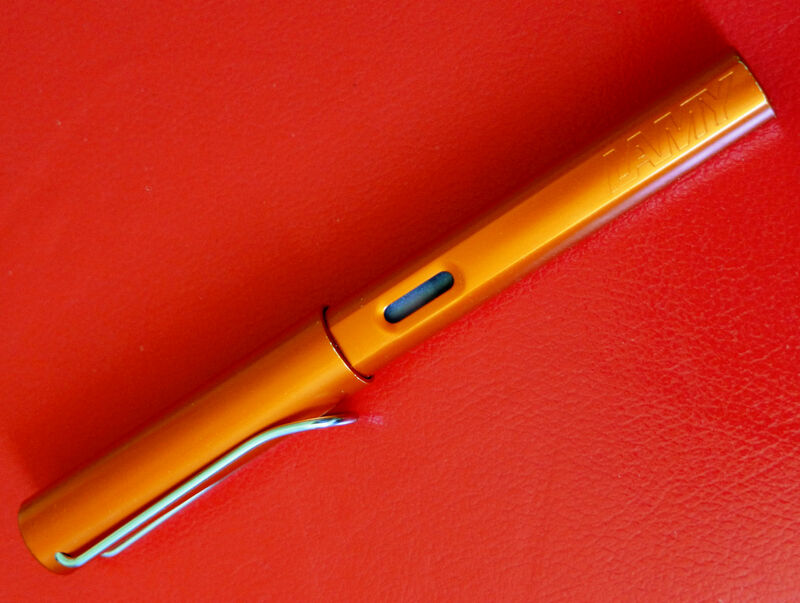 Combined with a protrusion under the strong clip, this pen should be very secure in a pocket. 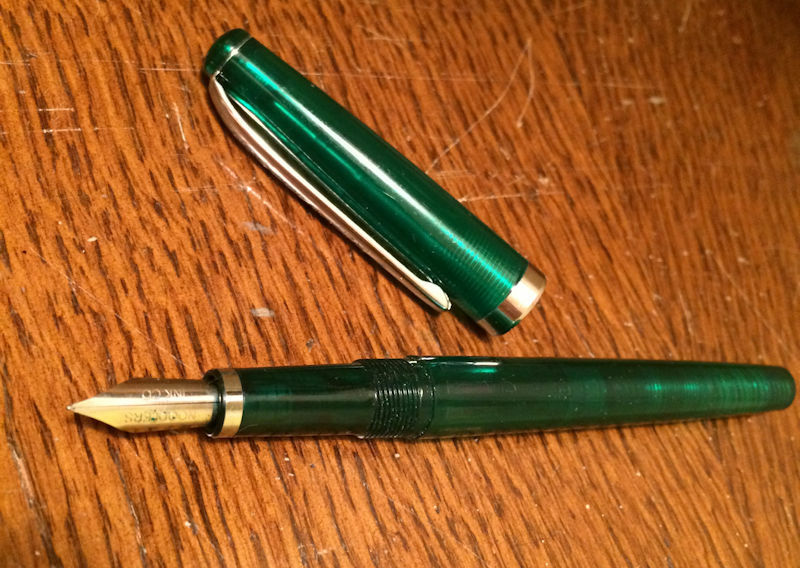 Many of these Chinese pens are tributes to earlier designs; this heavy stick seems inspired by the Pelikan Toledo but does not feature the clear green ink window of the original. 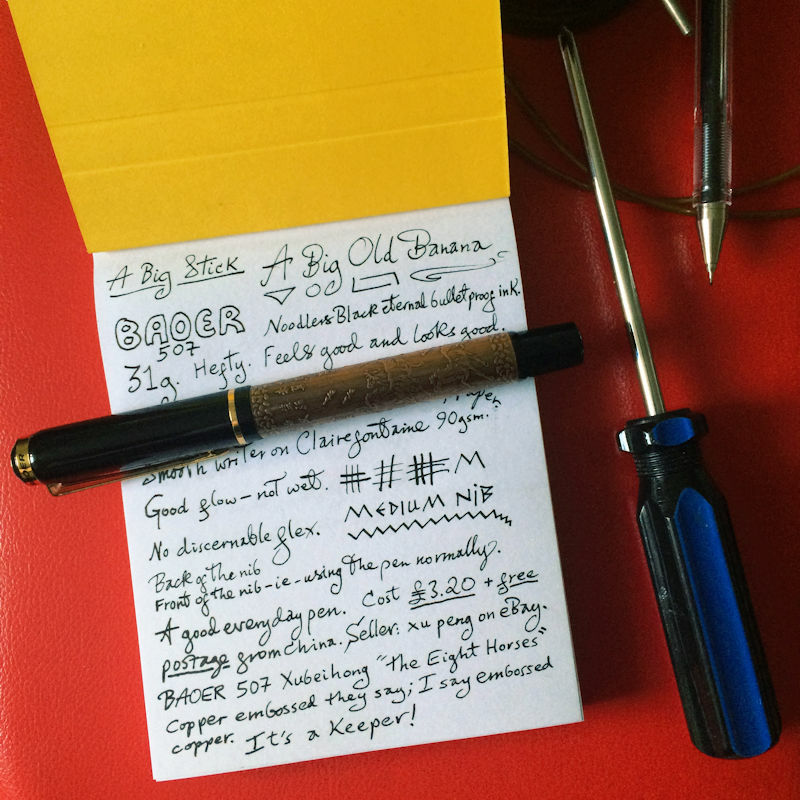 I tested the 507 with Noodler’s Black eternal bulletproof ink—it seemed apt. 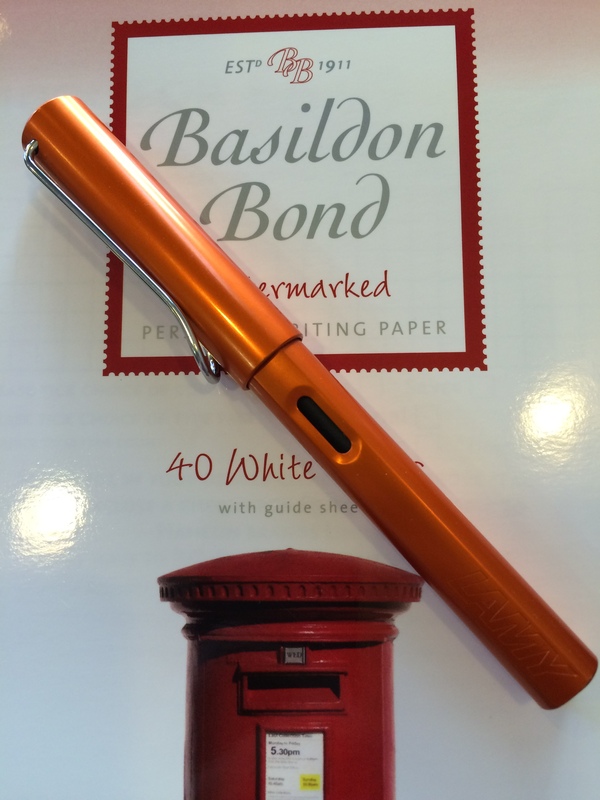 It’s a smooth writer on Clairefontaine 90 gsm paper with no skipping. 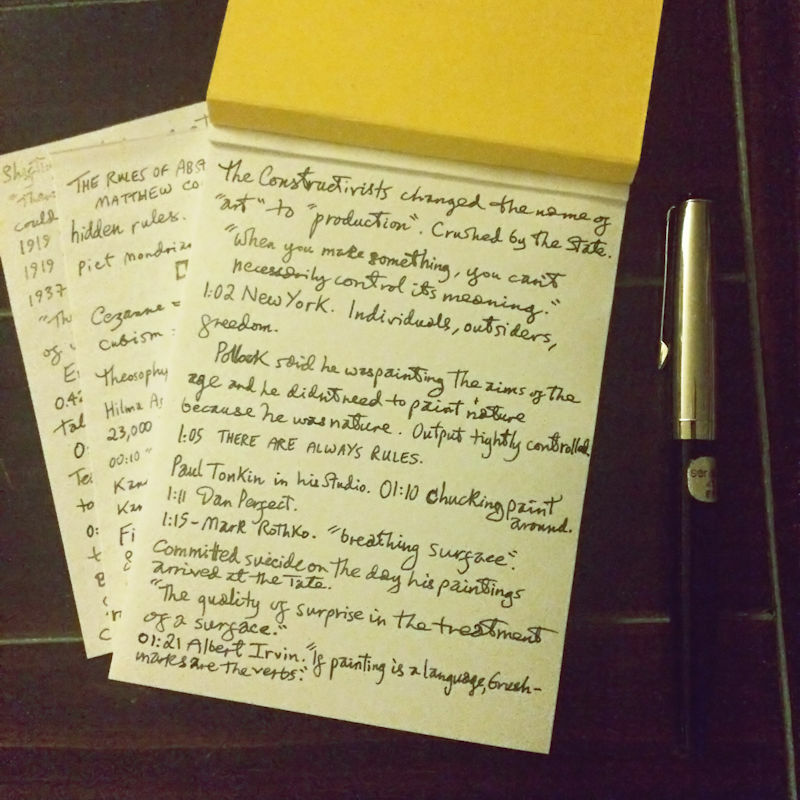 The ink flow is fine, not too wet, but sufficient to push me to write larger on cheaper paper to ensure legibility. The nib is medium-sized with no discernible flex. There’s a little give: the nib is not as hard as a nail. Inside the pen is a cartridge convertor equipped with a piston. Thus it’s a dipper, not a changer. 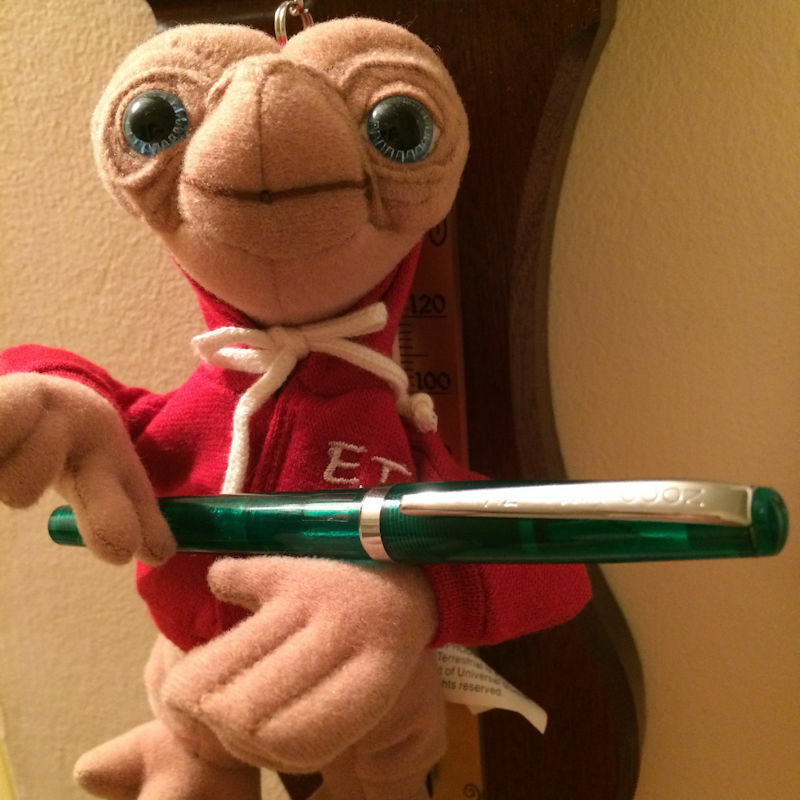 Overall, this is an impressive pen that would not look out of place signing a naval treaty. Just don’t tell anyone it cost five dollars. It’s a keeper.